Truly flexible electronics are still part of the realm of science fiction, but research engineers at the Carnegie Mellon University have made a breakthrough which could bring them to reality. A new metal alloy that exists in a liquid state at room temperature holds the potential to enable liquid metal transistors, flexible circuitry and possibly even self-repairing circuits in the future. Carmel Majidi, Michael Dickey, and James Wissman of the Soft Machines Lab at the university created their new alloy with a combination of indium and gallium. The metal is entirely liquid at room temperature and is a good conductor of electricity. 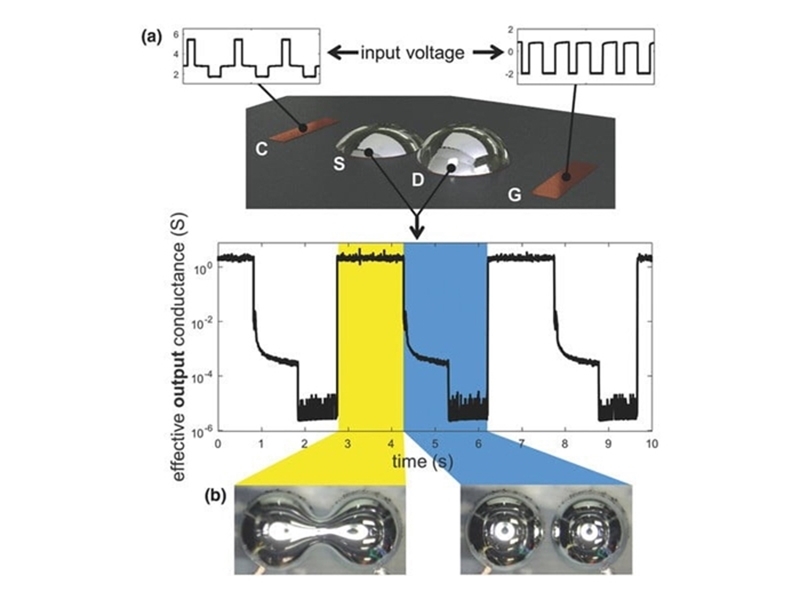 By applying a current to two liquid metal droplets, a circuit could be formed, or broken, effectively opening and closing a gate, much like a traditional transistor. Liquid transistors would allow for much more flexible circuitry than we’re used to, potentially opening up the door for smart fabrics and much more malleable electronics. If a circuit could be physically altered through the application of current, it’s entirely possible that it could be reconfigured to perform different functions as and when needed, as Hexus points out. That ability to rebuild itself could also enable the creation of circuits which could repair themselves if damaged. The key to this new alloy is its lack of any real complicating factors. Its ability to operate in a liquid state at room temperature removes any major cooling or heating requirements. Unlike other room-temperature liquid metals, like mercury, this new alloy is entirely non-toxic, so it’s safe for humans to handle and use. Better yet, it requires a moderate voltage of just 1-10 volts to create the liquid transistor effect. That’s a similar voltage to traditional solid-state transistors. The only concern with the materials used in this experiment was their potential lifetime. Those behind the study believe that as it stands, the gallium may decay to a less versatile state. One potential remedying factor though is to use more inert electrodes like gold or graphite. While such technology is still years away from being applicable to commercial electronics, it holds an exciting potential for technologies that until now, were seen as near-impossibilities with existing materials. This isn’t the only fluid development which could overhaul computing as we know it. '5D electric blood' could be the new wonder material of tomorrow’s high-end electronics. You can check out our transistor products here.